Tom Martin Poland places great importance on maintaining and upgrading the quality of material where possible. Segregation and sorting is second nature to us – we always seek to develop specialist markets for our material, ensuring maximum returns are achieved for the waste. We deliver a service tailored to individual needs, from infrequent collections of small quantities, right up to a fully integrated, on-site, total waste management package. We have a wide range of storage equipment and we are always prepared to invest in additional tailor-made solutions in partnership with our customers. Fully integrated total waste management including full-time employees on site. Tailored package and custom-designed storage equipment if required. 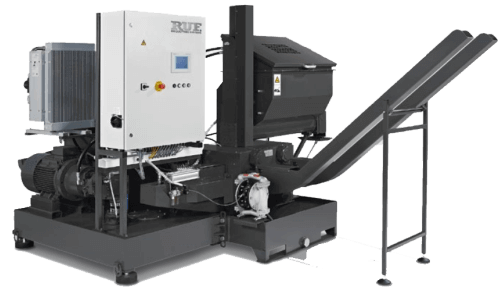 Investment in on-site equipment such as swarf briquetting machinery, shredding and baling equipment, installation of scales/weighbridge with no capital expenditure required from the customer. Regular collection service to a set schedule or as and when required. Clear, transparent pricing and free provision of any storage equipment. Contractual terms linked to Metal Bulletin indices or to the London Metal Exchange. Comprehensive monthly reporting on grades, quantities and values.